That phase of my career that required reporting the statistics of corporate research (i.e., making numbers talk) also honed my writing skills. I learned how to analyze data in a way that revealed meaningful information then write the report as succinctly as a journalist would report facts. (I took a night class in journalism at Michigan State.) I created the report layout in PageMaker software to produce a USA Today-style newsletter. Space and page constraints made each report a sort of short story with a plot (would the new product entice our target buyers), a beginning (the research plan), middle (the three-day event with a cast of hundreds), and a conclusion. But numbers and I were often at odds so I thought about a new career. It was during this time that I flew to San Francisco to take a course in screenwriting. I learned about characterization and conflict, and how place and scenes move the plot forward as well. I also learned that the field wasn’t all that open to newcomers. Sigh. When I retired from corporate life and decided to relocate close to my family--leaving Michigan for the coastal clime on the shores of the Gulf of Mexico--I destroyed all the sodden pages of angst-laden poetry and journals I’d accumulated over the years. They comprised the mournful scenes of a memoir that I am not brave enough to write nor let be discovered, lest my frailties be laid raw and exposed to my family. I am, after all, Superwoman. That's all for this time. Keep on keeping on, folks, and I'll try to do the same. Note: If you ever have a chance to get some pointers on screenwriting, do it. The scenes become alive, smooth, and complete as you visualize your character moving through your story. 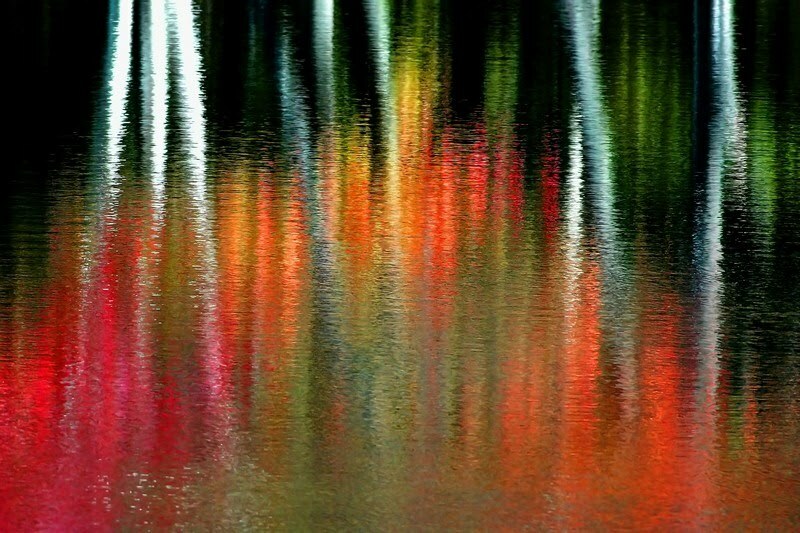 The Jeff Johnston photo is of the reflections of birch trees in a small pond in New England. It's call Pond as Prism. End of the story . . .
My writer's journey continues . . .